Prepare yourself for a battle between good and evil in a brand-new book series from Adventures in Odyssey. Meet The Blackgaard Chronicles, a series that long-time fans, as well as newcomers, will enjoy. Adventures in Odyssey radio dramas are fast-moving and exciting. But there’s only so much story that can be told in a half-hour episode! In these easy-to-read novels, kids ages 8 to 12 will learn more of the back story on their favorite characters and events, as well as find themselves in the middle of more adventure and suspense! In these first two books of The Blackgaard Chronicles, the evil Dr. Blackgaard starts his attack on the town and people of Odyssey. How long will it take for wise Mr. Whittaker to realize what’s happening, and can he respond in time to stop Blackgaard’s nefarious schemes? A conniving city councilman is secretly carrying out plans against John Avery Whittaker and Whit’s End. Yet Philip Glossman is only a pawn in a dark game played by the mysterious Dr. Regis Blackgaard. Meanwhile, against Whit’s express orders, Eugene and Connie tamper with a top-secret computer room—and the destructive Applesauce program is unleashed. Discover The Blackgaard Chronicles, a new book series that explores more of the story beyond the Adventures in Odyssey audio drama series! For fans of Adventures in Odyssey, The Blackgaard Chronicles book series will be a great companion to the popular story arc presented in the award-winning audio series. You’ll find that many more details are provided which bring a new perspective to all the exciting happenings in Odyssey. 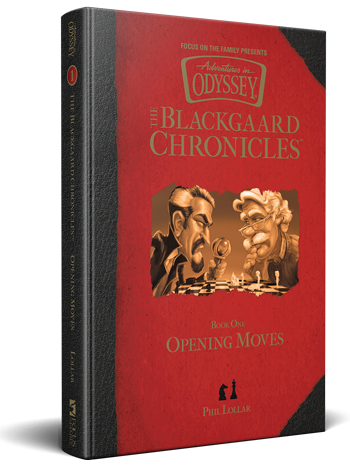 Books 1 and 2 (Opening Moves and Pawn’s Play) will be released this fall in hardcover with a beautiful gold foil finish on text. If you’re a member of the Adventures in Odyssey Club, you’ll be able to read Book 2 online for a limited time later this month. 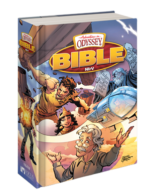 With the 30th birthday of Adventures in Odyssey right around the corner, it’s an exciting time to follow along for the adventure. Will you be getting your hands on your copy of this exciting release? Sound off in the comments below!